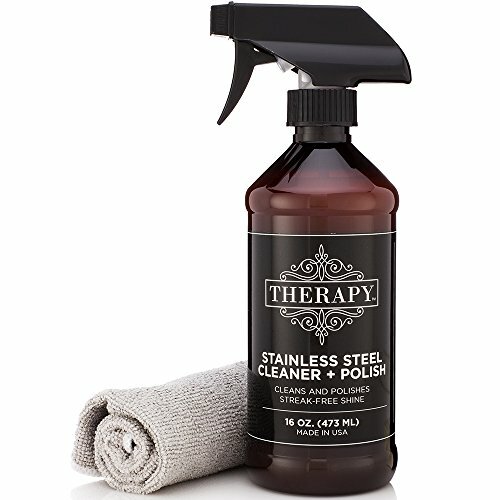 Therapy Stainless Steel Cleaner & Polish was created to give you a safe, effective, and satisfying cleaning experience. Traditionally, stainless steel cleaners and polishes are made with nasty solvents, mineral oils, and silicones. Who wants that in their kitchen? Therapy is blended using 100% natural coconut oil to effortlessly clean and polish refrigerators, ovens, microwaves, faucets, grills and more. Plus, we've incorporated a vanilla lavender essential oil fragrance to provide a soothing aromatherapeutic experience. You'll be left with a streak-free finish that looks, feels, and smells great. Therapy is a small, New Hampshire based company that specializes in manufacturing products that work exceptionally well while being safe for you and your family. We proudly list all ingredients on our packaging so you know what's inside. And, we stand behind our products with a 100% satisfaction guarantee. View More In Cleaning Supplies. If you have any questions about this product by Therapy, contact us by completing and submitting the form below. If you are looking for a specif part number, please include it with your message.